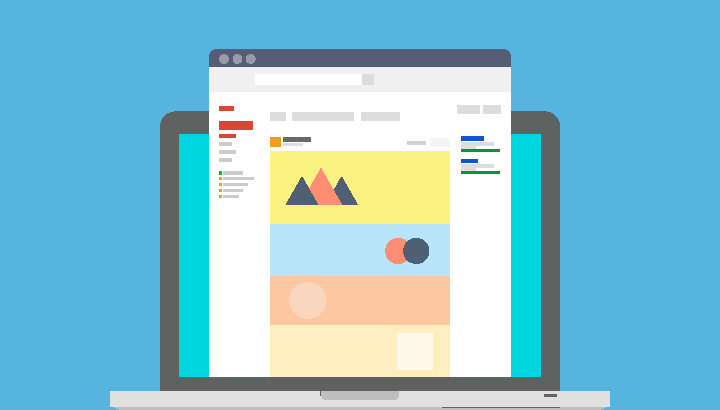 With Google’s ever-increasing preference to show its own controlled web properties on search results, having a Google My Business (GMB) listing nowadays is as important as having a website. That makes maintaining and optimizing it as important as well. Not only does a GMB listing act as an extra web property on search result pages, more importantly it shows up for branded searches (searches related to your name, company name, or brand). This offer users quick information about you and several call-to-actions aimed at converting users to a lead. Having a GMB listing will also improve your chances of appearing on local pack results. Fortunately getting started with and optimizing your GMB listing is quite easy. Below are just some tips. 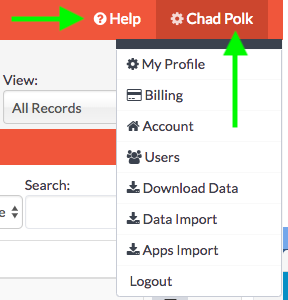 This article assumes you have already either claimed your GMB profile or have setup one up. Take extra care to ensure that every piece of information is accurate, especially your address and phone number. Keep in mind that users will rely on your GMB listing to contact you, go to your website, or visit your location. Inaccuracies will likely mean lost leads. It is very important to have the exact same name, address, and phone number (NAP) has you provide on your website. Google can detect the NAP character for character and match up your business based on NAP with your other web properties (your website, LinkedIn, Facebook, online directories, etc). If you change your location or phone number don’t forget to update our GMB listing as well. GMB allows you to enter various info about your business. 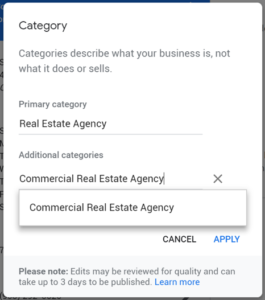 As much as you can, fill up every field as this can help your listing perform better to appear in search and user engagement. Category, for example, will help your listing appear for relevant search queries. Another key area is the business description. Although it accepts up to 750 characters, only about 245 characters will appear on load of search results without searchers clicking on the “read more” link. So make sure to be concise and mention key phrases early such as areas you service or if you specialize on certain property types. To set user expectations, and also to avoid getting calls at 10 in the evening, it is best to set your hours of operation. In this section you can also define your workdays. Another great conversion point that GMB offers is the appointment link. This can be pointed to your Contact page of your website or other land page. Keep in mind that users that will click on this link are ready to talk business so it would be best to link it to a clear, simple page with your contact information or form. Although you can upload as many photos as you want, it would be best to just pick those that represents your business best. Your office including an exterior photo, your lobby, and other interesting areas. Also upload or pick a photo that would best suite as a Cover photo, profile photo, and logo which would be used to brand your GMB listing. 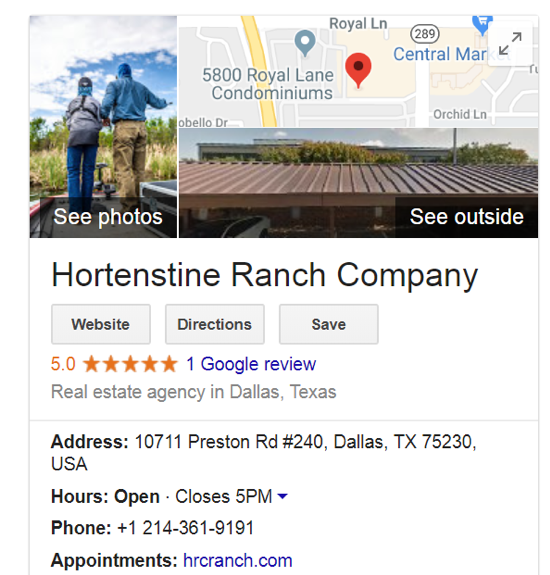 Unlike restaurants, shopping centers, and other ultra popular businesses, reviews are harder to come by in the ranch real estate industry so make each one count. A quick email or private message asking previous clients to leave a review will go a long way. It will be good to mention to them how easy it is to leave a review. One helpful tip to get more reviews is make it easy for clients to provide the review by giving them a direct link. 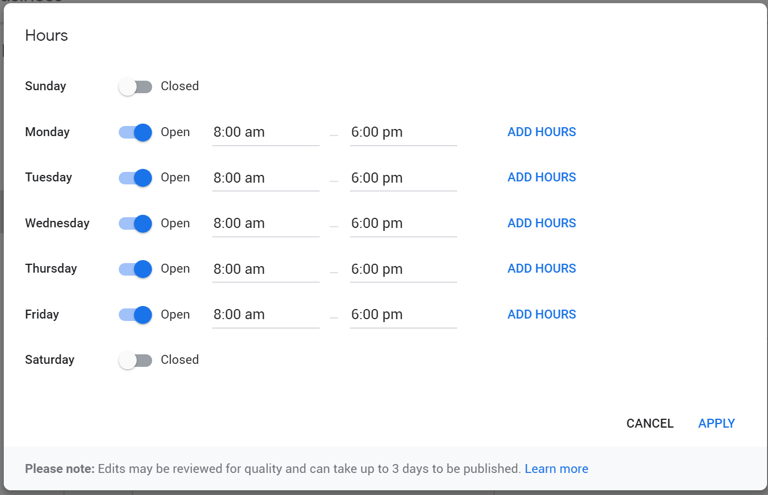 In the Google My Business Help article it provides steps to generate a simple URL that clients can click to give you a review. You don’t need to reply to all reviews but it would look good on your GMB listing if users see that you are active. If someone leaves a positive review, do your best to highlight your experience with that client. In case you do get a review with even just a hint of negativity, reply professionally to address the issue and provide resolution. Blank one star reviews are a nuisance and can pull down ratings. Instead of leaving it as is, at the very least leave a reply asking for more information. Users can ask questions about your business which anyone can answer. Get on top of this quickly to make sure that it is addressed correctly and again to show that you are active. 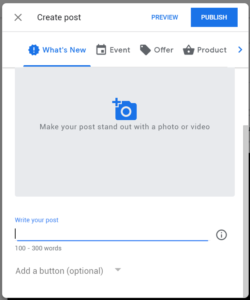 This a relatively new feature introduced by Google wherein, similar to Facebook and Twitter, you can now post “updates” about your business. These posts will appear with your GMB listing and can be used to further help convert searchers. There are several forms to choose from all of which can be linked to any of your pages thus making this a great place for advertisements or promotions. A post expires after 7 days though so remember to update frequently. If you create a Google Business Site, it will appear on there indefinitely though. A Google Business Site is another good opportunity to create a business web property that can help your SEO. The REALSTACK SEO team can help you with that if interested. GMB Insights has dramatically improved in recent years and now includes powerful “Insights” which are reports. These power packed reports give your brokerage great visibility into the importance of ranking on Google for both your branded keyword phrases and market defining phrases. How customers search your business – displays both direct searches for your business and other market keyword searches. Queries used to find your business – Google can literally tell you the exact phrases used to find your business or that your GMB profile ranks for. 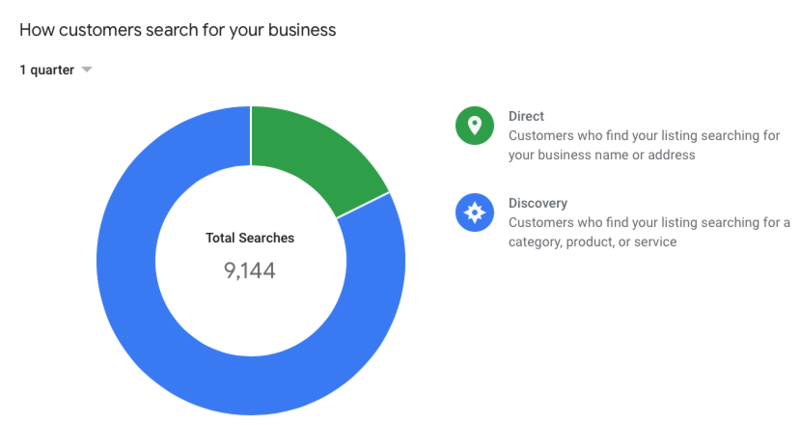 Where customers view your business on Google – this report can provide customer visits to Listings on Search vs Listings on Maps. 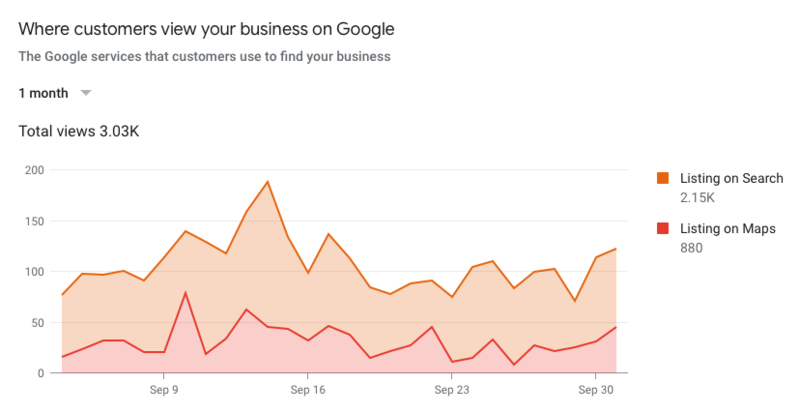 Customer actions – Google shows an interesting chart to demonstrate the most common actions that customers take on your GMB listing such as visit your website, request directions, or call you. Good information to know. Directions requests – for most land brokerages this may not be a big number, but it implies the importance of having a solid GMB profile when it is needed by a prospective customer. Phone calls – good bar chart to show when and how many times customers call your brokerage. Photo views – The number of times your business photos have been viewed, compared to photos of other businesses like yours. Make sure to upload your own photos to GMB! Photo quantity – not the most powerful chart, but good to visualize the number of photos that appear on your business, compared to photos from other businesses. Google My Business is very easy to setup and configure. It can be an important web property for your land brokerage and also make you look stronger online. Get started by visiting their website. If you’d like help with GMB or search engine optimization, contact our great marketing team at REALSTACK. We know land marketing and love helping brokerages! The ever expanding REALSTACK platform has now added LANDFLIP and its network of land websites to LandSync, our system to feed land brokerage listings to any online advertising website automatically. With automated listing feeds to online classified websites, land brokerages can input their listings once and then have those completed listings synchronized with their accounts with online land websites such as LandFlip. In 2003, LANDFLIP was founded by Ryan Folk in Atlanta, Georgia. Ryan was a successful real estate broker with experience in software sales and consulting, and with the demand to create an alternative to traditional print media he launched LANDFLIP.com. It soon became his main marketing channel of his own listings and even more so for other brokerages in the region. In the early years Ryan was able to bring on a partner, Tate Reddick, who together they have grown the LANDFLIP network to be one of the most popular land marketing platforms in the industry. In recent years, they have rebranded as the LANDFLIP NETWORK and is now managed by former land brokers and boasts one of the largest sources of land listings, land buyers, and land professionals from across the nation. The team at REALSTACK has been locked away working in a dark room cranking on new products and features, but we still managed to add some helpful features and fixes in recent weeks requested by clients. We’ll always keep listening no matter how busy we are conquering the world. Lands of America feed now runs every 3 HOURS!!! Yes, you read it correctly. REALSTACK is the industry’s first to offer continual daily updates to your Lands of America properties through our robust feeds platform. That means your listing updates get published on LandsofAmerica.com within a maximum just several hours. Bam! New reports now LIVE! 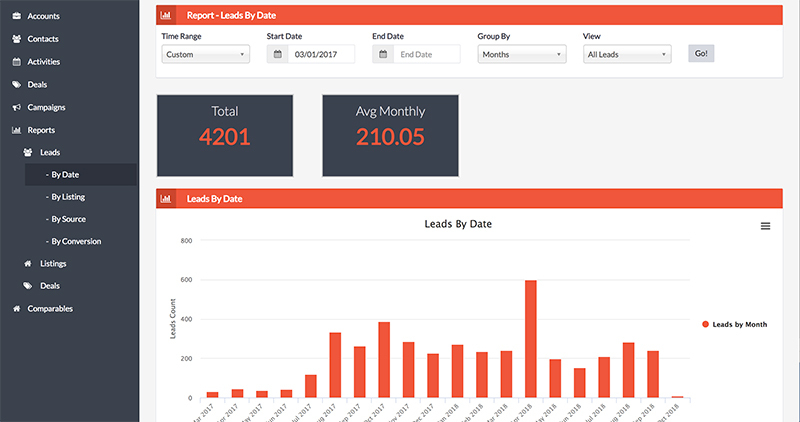 We are capturing so many leads for clients that we had to build more reports. The platform now has 3 categories of reports: Leads, Listings, and Deals. 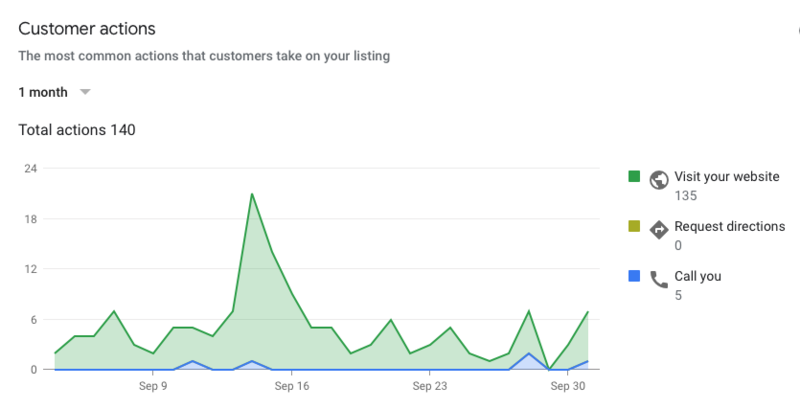 Listings Performance Report – single page view for individual listing leads, showings, campaigns, deals, and more. All tables now maintain state – what is “maintain state”? Well when you chose a filter and/or sort on the listings table, navigate to another web page, and then return to the Listings table …voila the table still has the same filters and sorts as previously set. New listing types – “Single Family” and “Lot” have been added as listing types. Listing type change – “Residential Land” listing type is now changed to “Residential Property”. Help & setup additions – We’ve started a YouTube video channel and playlist with some videos to help you get started with REALSTACK. You’ll see new icons and text now in the top right corner of your screen after you login. Watch some of our vids and let us know what you think AND what videos you want us to create next. Acreage decimals increased – listing acreage now support 3 decimal places (thousandths) instead of just 2 (hundredths). Logging Multiple Activities – Submit & Create Another Activity now defaults the activity status to ‘Not Started’. This is very helpful when completing one activity and then planning for the next follow-up activity. Create New Contact from Account Detail – previously Contact Address 2 field was not auto-populating from the Account Address 2. This has been corrected. Deals table – now displays the Deal Stages in the filter listbox in the order of the sales funnel. Listings table – now displays the County Name for each listing. Print preview – the web display of the print preview has been corrected. Reports menu – with all the new reports, we needed a much better way to categorize and organize the reports. Reports navigation now has a menu tree which has 3 child navigation menu items with sub-items for each report. Enjoy! Activities on Listing Performance Report – a bug has been corrected where not all the completed activities were showing on the Listing Performance Report for a particular property. This is now corrected. Created and modified dates – a handy little addition, now on the listing detail and contact detail screens you will see the created date and last modified date. Many new features are in the works, but we are always all ears when it comes to client feedback. If you have a great idea or just a small idea that would help your brokerage, contact us and let us help you even more.